We’d love your help. Let us know what’s wrong with this preview of A Royal Holiday by Marianne Knightly. The season for stolen kisses and royal wishes is here. Catch up with the Vallerian royal family as they celebrate the holidays together … and apart. The day of the Holiday Ball – and her engagement party – has finally dawned for current commoner and future princess Rebecca, who has been swept up in a whirlwind of royal pomp and circumstance ever since she fell in love with The season for stolen kisses and royal wishes is here. Catch up with the Vallerian royal family as they celebrate the holidays together … and apart. 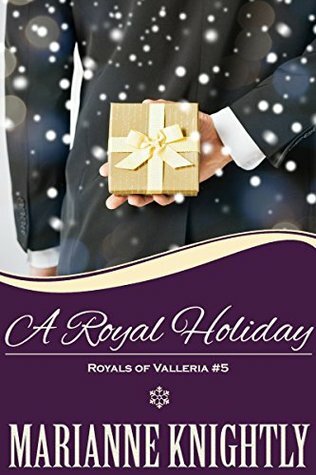 The day of the Holiday Ball – and her engagement party – has finally dawned for current commoner and future princess Rebecca, who has been swept up in a whirlwind of royal pomp and circumstance ever since she fell in love with Alexander, her fiancé and heir to the throne … Alex is ready to spend the holiday wrapped in his love’s arms. When a royal scandal breaks just days before the ball, sending his reputation into a tailspin, will they recover in time to navigate through a Holiday Ball and their first Christmas together? English Lady Grace’s troubled past still haunts her. After years of difficult holidays, she’s ready to make some new memories with her prince, Marcello. But can she give him the one thing he wants most? … Marcello knows the holidays are difficult for Grace. Will he be able to help her through these difficult days, or will managing the royal scandal keep him from the one person he loves most? Charlotte, head baker for the Vallerian Royal Palace, has been working at a frantic pace leading up to the holidays due to the Royal Holiday Ball, multiple parties, dinners, and events in the works – all while recovering from a gunshot wound. She’s barely had any time to spend with her own prince, Nate, much less think about what she should get him for the holidays. What do you get a prince your first holiday together? … Nate is so proud of his lady love, but needs some time alone with her, away from the palace and their work. When Nate decides to spirit Charlie away, will his surprise rise to the occasion, or fall flat as a bad cake? Pregnant Princess Arianna has made a home in the small country of Brazenbourg with its prince, Finn, but her first holiday away from Valleria proves to be harder than expected … Finn would do anything for his princess, including pulling off the impossible. Can he make a miracle happen and grant Arianna her most fervent Christmas wish? Come visit Valleria this holiday season, where surprises abound, dreams might come true, and a series of events plans to make for a very interesting New Year. *Please note: this is a novella, with content suitable for mature audiences only. *This is a standalone book in the series, and may be read as such. However, you may prefer to read the other books in the series first. To ask other readers questions about A Royal Holiday, please sign up. So good to get this little update on each couple around the holidays. I also liked the little contention between Rebecca and Alex. Couples are going to have that, it is good to see how they do handling it. I love how the author thought about a holiday novella foe the series. It makes it feel like tour there with the family celebrating. Even though there is a scandal I still loved it. A perfect holiday read ! This catches up on the four royal couples life. Lots of love scenes, swearing too much for me. Did have some special moments, a scandal and a charming ending. Love the Royals! Such a cute story full of drama and intrigue. I really enjoyed the glimpses of every couples stories, that gave us wonderful updated.